A Synopsis of the History of Our Lady of Lourdes Parish, Wanstead. It is good to cast our minds back to the beginnings. Difficult as it may be to realise that Wanstead remained a village into the 1920’s and it was from the building of the railways, the population of the Walthamstow and Leytonstone areas increased. There was no Diocese of Brentwood as the area came under the auspices of the Arch-Diocese of Westminster. A Mission was established at Wanstead in 1849 and its territory then extended as far as Barkingside and Romford. In 1909 Fr William O’Grady, the Parish Priest of St George’s Walthamstow, (later the first Vicar General of the Brentwood Diocese), opened a Mission in Wanstead when he bought a small brick building in Hall Road, the present Gardner Close Estate, which is situated just down from the George public house. This building started life as a Methodist Church, and ended up as a greengrocer’s store until its demolition in 1966. A parishioner attended Mass as a child with her father in this first building and indeed lives at present in Gardner Close. In December 1917, at the invitation of Fr O’Grady, the Sisters of Mercy, opened their convent in Cambridge Park, the stables being converted into a temporary Church. Below are Fr Sammon’s words from the Order of Service for 10th December 2010 when the parish gathered to remember the occasion of a 100 years ago when Mass was celebrated in Wanstead for the first time since the reformation. How prophetic those words have turned out to be. This ‘little mission’ has developed into the parish of Our Lady of Lourdes, Wanstead, which, thank God, is an alive and thriving community. From that little acorn planted 100 years ago a mighty oak has blossomed forth. The indefatigable Father O’Grady, later Vicar General of the Diocese of Brentwood, who became Monsignor O’Grady, was an Irishman from Co. Clare”. The first Parish Priest, Fr Basil Booker was appointed on the 4th August 1919 and his first concern was to find a site for a permanent Church and he purchased a market garden in Cambridge Park for this purpose. 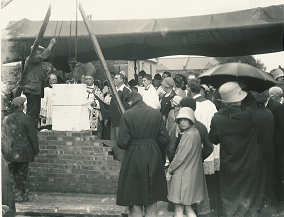 The foundation stone was blessed by Arthur Doubleday, the then Bishop of Brentwood, in July 1927 and the centre aisle was soon completed and the Church opened on the 13th October 1928. Some months later the altar was consecrated and the Stations of the Cross, painted by the father of Fr Booker, were blessed. The side aisles had to wait, but to secure the building, the east aisle was opened in 1934 and the west aisle was opened on the Feast of Our Lady of Lourdes in 1940. On his first arrival in the parish, Fr Booker lived with a local family but he bought a house in Wellesley Road in 1922. The permanent presbytery was erected next to the Church in 1931. Attention now shifted to the opening of a parish school, and the first school was opened in the server’s Sacristy where lessons continued until the opening of Our Lady of Lourdes School in 1961. After the Second World War, the parish began to expand rapidly with mass attendance doubling to 2400 between 1948 and 1960 and, with it, the number of children needing a school. The second Parish priest, Fr James Hemming, was appointed in 1952. A Hall had already been planned, and Fr Hemming raised a considerable sum for it. However by 1957 it was clear that there was a greater need for a proper school, and so this was built instead. It opened its doors in January 1961, though not formally opened until September 1962. The other primary school in the parish, the fee-paying St Joseph’s Independent School for Girls had opened in 1918 and initially many boys received their infant education there. When in the mid 1960s a new parish was started in South Woodford, a considerable section of the northern end of Wanstead Parish was transferred to the new parish of St Anne Line. In 1970, a new Parish Priest was appointed, Mgr. Christopher Creede, who was also Vicar General to Bishop Patrick Casey. In accordance with the Postconciliar liturgy, he rearranged the Sanctuary, with a new altar and ambo and in time for the Golden Jubilee in 1978, he redecorated the Church. After 30 years as Parish Priest, Mgr Creede retired on the Feast of Our Lady of Lourdes 11th February 2000 and Fr Patrick Sammon arrived to become the fourth Parish Priest. Fr Sammon soon after his arrival called a Parish Meeting to ask parishioners what were the needs of the parish so that a plan could be made for the future. This took place in Our Lady of Lourdes School and a full hall indicated that the whole parish felt involved and wished to be an active part of the way forward and implementing a new vision for the parish as a result of this meeting. Fr Sammon and the Parish Pastoral Council incorporated some of the initiatives right away and some took longer to be implemented. A momentous stage was marked and the dream of so many parishioners fulfilled with the opening of the new Pastoral Centre at Our Lady of Lourdes Wanstead in September 2002. This completed a key element in the life of the Parish enabling not only social gatherings but primarily providing rooms for sacramental preparation programmes and for all the various and numerous pastoral groups and the many social activities that take place. The preparation for the 75th anniversary of the opening of the Church in October 2003 saw many initiatives being undertaken with the complete redecoration of the Church and many areas of restoration not only within the Church but also without, not forgetting above, with the securing and repairing of the roof. In the spring of 2003, a new and beautiful Baptistry, which expresses the importance of Baptism and our entry into the people of God, was located at the entrance to the nave. The newly decorated Church also reflects a noble simplicity and with the opening of the repositioned grotto of Our Lady of Lourdes at the west side of the Church all works were completed in time for the celebrations. In 2006 the reordering of the church was completed with the new altar, ambo, new Blessed Sacrament Chapel with a new tabernacle, chancel screen and new floor for the sanctuary and side chapels. Descriptions of this may be viewed under the Sacred Items. Bishop Thomas consecrated the new altar and the relics from the old altar were placed within the new one. The Church was also dedicated during the Mass as this had not taken place before because originally there was a debt on the church. In 2008 the beautiful new bronze crucifix hanging in the sanctuary was installed thus completing the church as it is seen today. Fr Sammon has since his arrival encouraged even more lay involvement in all aspects of Parish life and at present there are seven Pastoral Assistants in the parish commissioned by the Bishop. The Pastoral Assistants role is, under the direction of Fr Sammon, to assist and support him in parish life. There are over 190 Extraordinary Ministers of Holy Communion who not only assist at Mass but most of them also take Holy Communion to the sick and housebound on a rota basis from the Sunday Mass. All sacramental preparation that is Baptism, First Holy Communion, Confirmation, RCIA and Ministers of Holy Communion and Ministers of the Word, is under the guidance of Fr Sammon, but coordinated and instructed by lay leaders/catechists. In 2011 a new and historic development took place in the parish with the reception into the Catholic Church during Holy Week of 90 members of the Anglican Church of St Margaret’s Leytonstone with their previous parish priest, Fr Robert Page. On the 14th May 2011 the ordination to the Diaconate by Bishop Thomas of seven ex-Anglican priests, including Rev Robert Page, took place at our Lady of Lourdes followed by a reception afterwards in the Pastoral Centre. 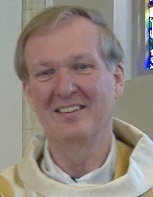 Fr Robert Page was ordained to the priesthood at Brentwood Cathedral on the 11 June 2011 and was appointed as Parochial Administrator of St John Vianney, Clayhall from October 2011 although he will continue to retain responsibility for the Ordinariate members at Our Lady of Lourdes. It can be seen from this brief history that Our Lady of Lourdes continues to be a thriving and active parish.